Repeating what has become an annual tradition, the Joint Mathematics Meetings of 2017 in Atlanta will include a poetry reading. Thursday January 5, 2017, 5:30 p.m.-7:00 p.m. Here is info about the reading and how to participate: Poetry + Math, organized by Gizem Karaali, Pomona College; Lawrence M. Lesser, University of Texas at El Paso; and Douglas Norton, Villanova University; Thursday, January 5, 5:30–7:00 pm. All who are interested in mathematical poetry and/or mathematical art are invited. Though we do not discourage last-minute decisions to participate, we invite and encourage poets to submit poetry (no more than three poems, no longer than five minutes) and a bio in advance—and, as a result, be listed on our printed program. Inquiries and submissions (by December 15, 2016) may be made to Gizem Karaali (gizem.karaali@pomona.edu). Sponsors for this event are the Journal of Humanistic Mathematics and SIGMAA ARTS. A complete program for the Mathematics Meetings is available here. A dozen years ago I visited Edinburgh and there became acquainted with the poetry of Scottish writer Muriel Spark (1918-2006) -- prior to that visit I had known Spark only as a novelist. Today -- prompted by Thanksgiving celebration with grandchildren -- I have remembered an English rhyme that my own grandmother teased me with in childhood, "Going to St Ives" and, from there, I've recalled a pair of Spark's rhymes that follow a similar pattern. I offer them below; despite strong rhyme, these are not entirely light fare--instead, they make us aware of the sad multiplication of bonds and wounds . . . I met a man with seven wrists. This poem by Emily Warn (a founder of PoetryFoundation.org) uses mathematical terminology to introduce us to the immeasurable horror of death by slow torture. May our nation never again engage in such atrocities! 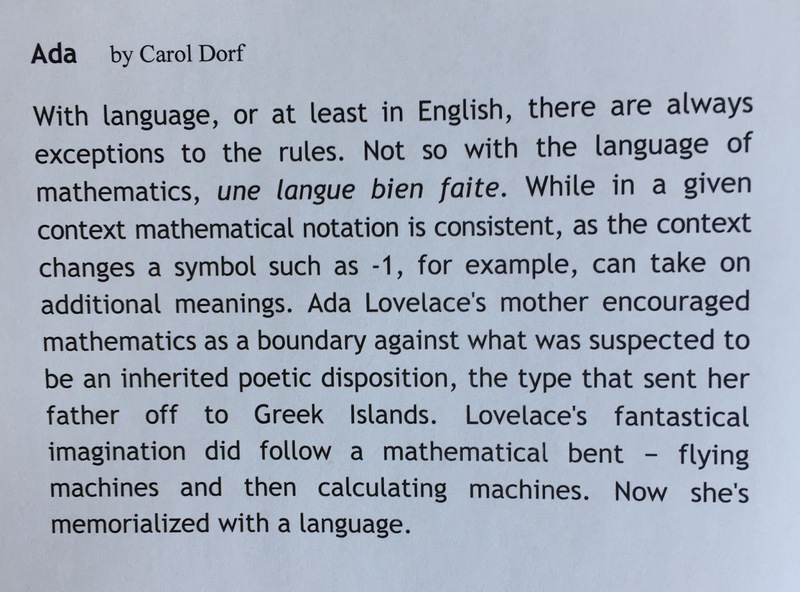 California math teacher, poet and editor, Carol Dorf is a vital force in the production and dissemination of mathy poems. A blog SEARCH using her name will find links to all of my mentions of her activity. Here is one such link -- to my list of titles of mathy poems in Talking-Writing, an online journal for which Dorf is poetry editor. 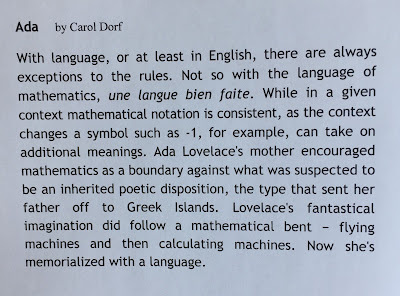 Dorf's poem below speaks of Ada Lovelace, a math-woman who has been featured herein on July 16, 2015 and September 18, 2015. Mathematics is "a well-constructed language." Dorf's "Ada" first appeared in Volume 14 of The Mom Egg Review. One of the fine new anthologies of 2016 is Of Poetry and Protest: From Emmett Till to Trayvon Martin, published by W W Norton -- put together by Phil Cushway (Compiler), Michael Warr (Editor), and Victoria Smith (Photographer). Here, from that collection, are the opening stanzas of Marilyn Nelson's "Cells and Windows" -- a poem that gains much of its power from the awful truth conveyed by its numbers. to be in jail than white men are. I found an lovely little autumn poem (after William Carlos Williams' "The Red Wheelbarrow") by Michael Khmelnitsky -- who declined to let me use it herein, and so I offer a link to it -- enjoy "The Gaussian Function." Today, November 7, is the birthday of Marie Curie (1867-1934, Nobel prize in physics, 1903). Curie is celebrated in this poem by Richard Aston, first posted in this blog on December 6, 2014 along with two other math-science-themed poems. Recently I was browsing through an oldish collection, The Best American Poetry 1999 (edited by Robert Bly) where I found and liked this poem by Marcia Southwick -- a poem that drew me in with its anti-pollution attitudes and its enumeration of some of the costs of pollution.